Having just finished Sorcerer to the Crown by Zen Cho, I knew I needed to dive right into The True Queen. What Cho excels at is delivering us charismatic characters, non-stop action, and excitement. The True Queen takes everything I fell in love with from Sorcerer to the Crown further. We are welcomed even more into the fairy lands, meet even more fascinating creatures, and get to see even more Prunella. Even more so, we are treated to Cho’s signature characters with the addition of Muna and Skati. There’s even a f/f romance within the book, even though it’s very light, similar to the romance within Sorcerer to the Crown. While you can definitely read The True Queen without needing to read Sorcerer to the Crown you lose out on a little history between the characters. You may think that the journey to having a Sorceress Royal had been an easy one, when in fact it was a challenging story about defying prejudices. What I enjoyed about Muna’s perspective is that she comes from a society where there are frequently women witches. So when seen in English society not only do they see her for being Indian, but also dismay at her magical powers. Her society offers a different perspective on the value of women’s powers and talents. Not only that, but Muna’s presence expands the magical world of these novels and allows us to explore new facets. 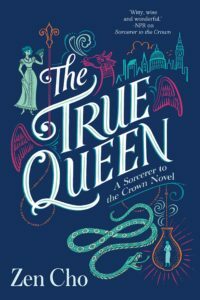 Throughout The True Queen there are characters you can’t help but adore, as well as a mystery about who these two sisters are. Granted we’re trying to get Sakti back and navigate English society, but what really hooked me was trying to figure out who they are. Find The True Queen on Goodreads, Amazon, Indiebound & The Book Depository. What is your favorite companion novel? This book is on my TBR. It’s good to know that this is a companion novel that can be read without reading the other. I don’t want to miss out on the history details though, so I’ll find the first book before reading this. Yeah! I think you’ll get a better experience if you read both!